Roaming charges ended in the European Union on 15 June 2017. 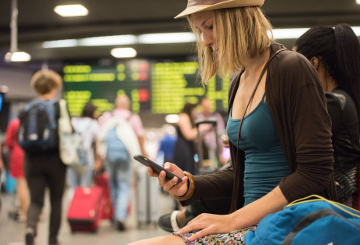 Europeans travelling within EU countries will 'Roam Like at Home' and pay domestic prices for roaming calls, SMS and data. The European Commission has been working since 2007 to gradually phase out roaming charges for travel within the EU. Since roaming fees ended on 15 June, people pay domestic prices, irrespective of where they are travelling within the EU. National telecoms regulators are responsible for enforcing the new roaming rules. If you use your mobile device in another EU country your phone calls, SMS and data consumed abroad will be charged the same as if you were at home. People will no longer have bill shocks upon their return. If you enjoy unlimited calls and SMS at home, this will now also be the case when roaming in the EU. National operators may apply a safeguard (fair use) limit on surfing the internet while roaming. If this is the case for you, your operator will have to inform you in advance about such limits and alert you when this limit is reached. If you reach your data limit while roaming, you can continue to use data roaming for a very small fee: up to 7.7€/GB + VAT, which is 6.5 times less than before 15 June 2017 and 25 times less than before April 2016. Roam like at Home is not meant for permanent roaming. If over 4 months period you spend more time abroad and consume more abroad than at home, the operator may contact you and ask to pay a small surcharge not higher than the regulated wholesale roaming caps (maximum € 0.032 per minute of call, €0.01 per SMS, and 7.7€/GB of data, plus VAT). If you travel periodically and spend more time in your home country than abroad over a 4-month period, you can fully benefit from ‘Roam like at Home’. If you get charged extra you should first contest those charges with your operator, who should have a complaints procedure in place. If you think that the operator is charging extra without justification, you should refer to the national telecoms regulator, who will settle the case. June 2007 - the "Eurotariff" caps maximum prices for phone calls made and received while abroad. September 2013 - the European Commission adopted a legislative package to bring down roaming prices further. October 2015 - the European Parliament and Council vote to end roaming charges when travelling in the EU by June 2017. Roaming changes: What has the European Commission done so far? Huge cuts in mobile data roaming price caps from 1 July – a drop of over 50% from last summer!